Torque’s work for USG Framing was recognized by the Business Marketing Association of Chicago last week at their annual awards gala. Kevin and Eric were in attendance to receive the award and are very pleased to add USG Framing to the list of clients that we have done award winning work for. Our work took silver in the category of total communications program over $200,000 dollars. Torque brought USG Framing to market during the first two quarters of 2006. Work included brand positioning, development of sales collateral materials, online and video marketing, and event and trade show marketing. To see our portfolio of work for USG Framing click here. 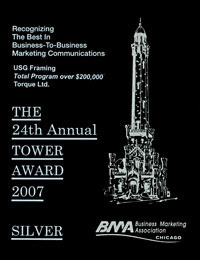 Torque has had work recognized by the Business Marketing Association for the last four years. For a full list of Torque’s recent awards click here.